I tell him that would be pretty strange, but pretty cool. I give him two hugs and a kiss and tell him what time I’ll be coming to pick him up (more to remind myself than to reassure him). Afterwards, I decided to go take a walk. I was feeling decidedly blah. It was only ten days before Christmas, and Chicagoland was abnormally warm at fifty degrees. It felt like spring, which meant mentally I’d checked out of Christmas festivities and moved on to fretting about swimsuit weather, soccer schedules and Easter. We had fog, rain, confused lawns trying to turn green again and confused Canadian geese going North instead of South. I started my short walk out by our pond. The first part of my walk took me past a garbage can that really needed emptying. Sticking out of the top was a grocery store shopping basket filled with vitamins and supplements. I am trying to figure out what it all means. What if…what if someone managed to shoplift the whole basket of stuff? He ditched it here because…the cops were on his tail and he had two strikes already? What if an unfaithful husband had taken on an affair with a much older woman, one who needed joint pain supplements specifically? What if his wife is one step away from finding out the truth about them, so he ditched the evidence? The path I take winds away from a small parking lot with the garbage can that contains a mystery, past cattail-filled wetlands and ponds. Then it runs alongside an elementary school. No one is outside, not the kids who would be out for recess, not the joggers. I suspect that the drizzle coming down kept the kids inside, and that Christmas shopping has kept the adults I might normally see in the mall. It is eerily quiet and still. I pad along hearing only a faint thud of my boots on the sidewalk. I keep tossing and turning my head looking for evidence of other human lives around me. I try to remember what human activity there might normally be: construction workers cleaning out storm sewers, SUVs passing me on the street, older neighbors wrapping up garden hoses or raking leaves, a mom slamming the trunk of her car in the driveway and grappling with grocery bags. None of it is here. All I can see is evidence of human beings having once lived here. 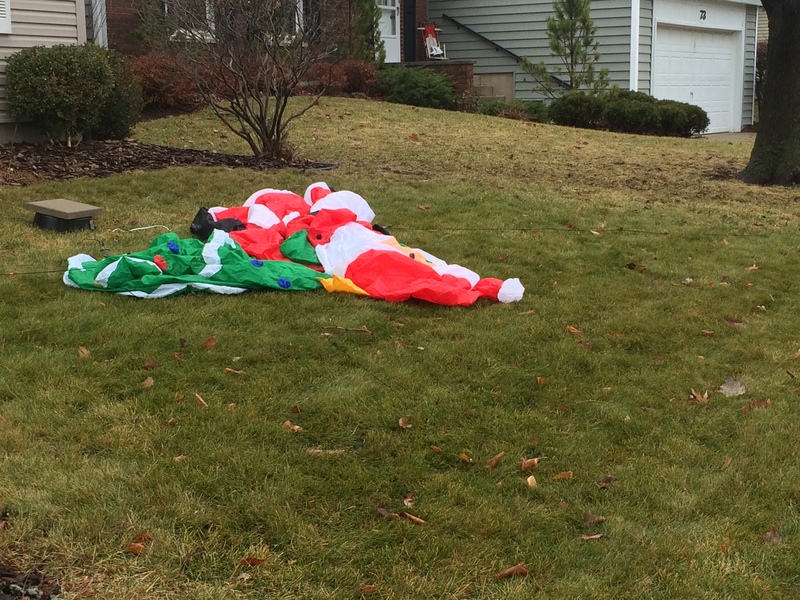 All that remains are their houses and the sad, deflated reindeer strewn across their lawns. Trees are budding and birds are singing. I start to imagine it really is spring, then become alarmed at how many houses are still covered in Christmas decorations. From my understanding of this community, the people are good upstanding citizens who (for the most part) take down the lights and inflatables and signs in a socially prescribed, timely manner. Responsible. What has happened here? It is as if something mysterious called them all away at once. I suspect that if I looked in windows I would see that the inhabitants left so fast that there are still dishes in the sink, laundry in the washer. Everyone has simply vanished! Like Roanoke, like a ghost town, like a zombie apocalypse. Was everyone killed? No, no bodies. Were they somehow abducted? Possibly, but if so by whom? Aliens? A government agency who decided the whole town knew too much? Did they leave of their own accord? Was there a disaster of such magnitude that no one could still live here? Is the air poisoned? Is the presence of geese and ducks and new grass evidence that we are the weakest of all species on earth, that humans pretend to be so tough but we can be wiped out in the blink of an eye and the rest of the world will still move on? Will this ghost town become a time capsule and mystery to future generations, a costumed tour guide exclaiming how, “No one really knows what happened here,”? I pause to take a picture of a squirrel trampling all over a flattened Santa, a reminder that one day nature will triumph over all of human culture, and that maybe that day is upon us. In the stillness I ask myself, am I the last person left on earth? I startle out of my story and realize that I am squatting in the middle of a sidewalk and blocking the way of a very nice and polite woman. She had to have been no more than a few feet behind me, and I never realized she was there. I have a feeling that in front of her she saw a discombobulated woman, a woman a little wild-eyed, a woman who was possibly muttering to herself and oblivious to the world around her, who inexplicably squatted down right in front of her to photograph someone’s unremarkable front yard. I get up quickly and mutter a shy apology while blushing and let her get twenty feet in front of me before I begin my walk again. And I wonder what story she is having to come up with to explain me.